Websites are created to fulfill a function which can vary from selling a product, to increasing membership registration or newsletter subscription, to simply communicating a message. Accordingly, the success of each is measured by different factors - number of sales, number of registrations, time on site, pages viewed - whichever contribute to the ultimate goal of the website. Once on a website, users are directed towards this goal through an internal funnel. The effectiveness of this funnel equates to the effectiveness of the overall website, encouraging users to complete the goal path in an easy and desirable way. Usually, the percentage of customers who proceed from link to link through a website becomes increasing less, until only a small number of people reach the ultimate goal. Each step reduces the number of visitors, and the number of people who leave the site mid process before completion are recorded as the drop-out rate. In an effective website, this drop off rate is low, and a fine-tuned internal funnel directs users clearly and efficiently to completing the website goal. 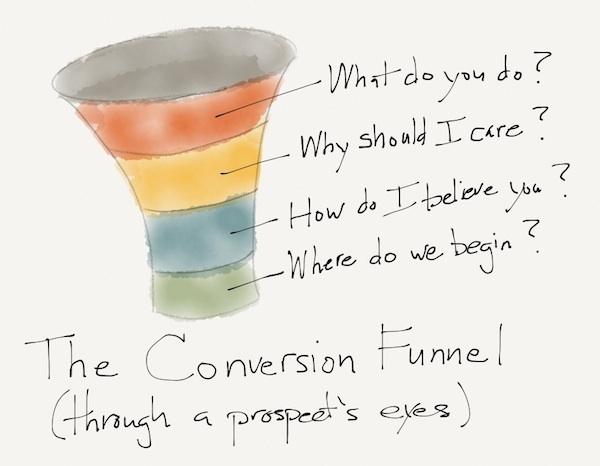 How can we use the internal funnel to increase conversion rates? Your initial aim when someone enters your website is to keep them there. The percentage of users who immediately leave a website is called the bounce rate - we want to keep this low. Design and layout sends an immediate message to a website visitor; an outdated and unprofessional website will see a high bounce rate, as visitors are cautious and suspicious of scam sites. Gaining trust instantly is essential to keep visitors on the site and avoid being mistaken for an abandoned 90s site. Credibility is created through sharp design with a clear layout that is modern and professional. This is not to say you can’t be more lighthearted or ‘fun’, but polished execution is essential. Colour and shapes set the tone of the website – curved shapes and bright colours are more playful, whereas sharp, defined duller colours are more corporate and serious – as ever, branding is important. But design is not only important for first impressions - the clear, uncluttered expression of your message throughout the website rests on it.Furthermore, design and layout play an essential, if sometimes subtle role in the functionality of a website, be that in creating novel and exciting ways to navigate your site or a simple, intuitive navigation. A website needs to allow the user to fulfill an intended goal, but it also needs to provide them with the most quick and easy way to do so. The way in which a visitor moves through a website to complete a goal is the goal path. This should be structural logically and be intuitive to follow. Firstly, plot the different paths which you want the user to use to pass through your site and streamline the routes, stripping out any excess steps. This reduces any opportunities for the user to get distracted, drop off and fail to complete the process. Once you have a refined goal path, make sure it is easy for the user to follow and clearly signposted, clearly label any calls to actions e.g. a ‘BUY NOW’ button. Eliminate any barriers to conversion - one of the most important is accessibility. Optimise your website for all main browers, long loading times or difficult tablet and mobile viewing will contribute to higher bounce rates. Regularly updated, relevant content that is targeted, concise and most importantly valuable reinforces credibility and trustworthiness. Your content should guide visitors through the website, telling them what they want to know at every step, rather than what you want to tell them. Let your company personality come through in your tone, you want to come across as relatable; a real person facilitating real engagement. Conversational style content has become popular recently for this reason, but this causal approach does not suit everyone. Once you have implemented these changes, you can use tools such as Google Analytics and SEOMoz to measure the effects of your actions. You can track conversation rate, bounce rate, drop-off rate and the impact changes have on each and the inter-play between them. Crucially, you are not going to get it right first time, websites need to be constantly tweaked through trial and error to improve the conversion rate. In reality a website may have multiple goals, requiring reaching a complicated equilibrium between these factors for optimum performance. Our preferred method for improvements on the funnel is small, regular iterations with constant analysis. Interaction between factors is complex and specific to an individual website, even minor adjustments to alter the balance, can make a large difference to the resultant conversion rate. The trick is finding the perfect mix that works for you.